By stayhomecupcake on July 11th, 2012 . Filed under: Cupcake Ideas, Kids . While perusing through Target today I was so excited to see something I have never seen before. 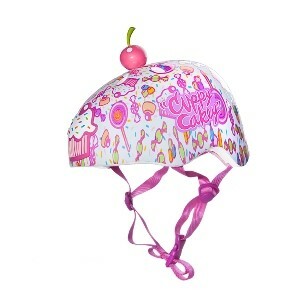 This adorable cupcake helmet is only $22! I love all the lollipops, candy and cupcakes but the best part has to be the cherry on top! It is available in most stores and online. Too bad it is made for kids ages 8 and up because I would totally wear this!